Adam Zagajewski was born in Lvov in 1945, a largely Polish city that became a part of the Soviet Ukraine shortly after his birth. His ethnic Polish family, which had lived for centuries in Lvov, was then forcibly repatriated to Poland. A major figure of the Polish New Wave literary movement of the early 1970s and of the anti-Communist Solidarity movement of the 1980s, Zagajewski is today one of the most well-known and highly regarded contemporary Polish poets in Europe and the United States. His luminous, searching poems are imbued by a deep engagement with history, art, and life. He enjoys a wide international readership, and his poetry survives translation with unusual power. Author Colm Toibin wrote in The Guardian: “With a sensibility damaged by history, a political conscience deformed by totalitarianism, a mind deeply affected by his study of philosophy, it would be easy to imagine Zagajewski writing veiled protest poetry (which he did in his youth) or poems entirely private and runic, bitter in tone and indecipherable in content, or even descending into shrill silence. He has instead been rescued by a fundamental belief in poetry itself, its autonomous and beautiful power in conflict always with its mundane roots in the visible and quoditian universe, “the whole coarse existence of the world”, as he puts it. He has been rescued also by the great pull in his work between a tragic conscience and a voice always on the verge of bursting with comic pleasure. He has been greatly assisted by his love of phrases and his talent for making them, and by a well-stocked mind and, most of the time, a glittering imagination. In 2016, Zagajewski won The Griffin Trust’s Lifetime Recognition Award that pays tribute to the work and achievements of international poets as well as the University of Tübingen’s Dr Leopold Lucas Prize for outstanding achievements in the fields of theology, intellectual history, historical research, and philosophy. Zagajewski’s most recent publication Slight Exaggerations, a collection of essays, was published in early 2017. His other books in English are Unseen Hand (Farrar, Straus, & Giroux, 2011); Eternal Enemies (FSG, 2008); and Without End: New and Selected Poems (2002), which was nominated for a National Book Critics Circle Award. Zagajewski’s other collections of poetry include Mysticism for Beginners (1999), Canvas (1991), and Tremor: Selected Poems (1985). He is also the author of a book of essays and literary sketches, Two Cities: On Exile, History and the Imagination (1995), and of Solidarity, Solitude: Essays. A major figure of the Polish New Wave literary movement of the early 1970s and of the anti-Communist Solidarity movement of the 1980s, Adam Zagajewski is the author of Unseen Hand; Eternal Enemies; and Without End: New and Selected Poems, which was nominated for a National Book Critics Circle Award. Zagajewski’s other collections of poetry include Mysticism for Beginners, Canvas, and Tremor: Selected Poems. His most recent publication Slight Exaggerations, a collection of essays, was published in early 2017. He is also the author of a book of essays and literary sketches, Two Cities: On Exile, History and the Imagination, and of Solidarity, Solitude: Essays. He now spends part of the year in Krakow, the city he lived in during the 1960s and 70s, and he teaches in Chicago. For Adam Zagajewski―one of Poland’s great poets―the project of writing, whether it be poetry or prose, is an occasion to advance what David Wojahn has characterized as his “restless and quizzical quest for self-knowledge.” Slight Exaggeration is an autobiographical portrait of the poet, arranged not chronologically but with that same luminous quality that distinguishes Zagajewski’s spellbinding poetry―an affinity for the invisible. In a mosaic-like blend of criticism, reflections, European history, and aphoristic musings, Zagajewski tells the stories of his life in glimpses and reveries―from the Second World War and the occupation of Poland that left his family dispossessed to Joseph Brodsky’s funeral on the Venetian island of San Michele―interspersed with intellectual interrogations of the writers and poets (D. H. Lawrence, Giorgos Seferis, Zbigniew Herbert, Paul Valéry), composers and painters (Brahms, Rembrandt), and modern heroes (Helmuth James Graf von Moltke) who have influenced his work. A wry and philosophical defense of mystery, Slight Exaggeration recalls Zagajewski’s poetry in its delicate negotiation between the earthbound and the ethereal, “between brief explosions of meaning and patient wandering through the plains of ordinary days.” With an enduring inclination to marvel, Zagajewski restores the world to us―necessarily incomplete and utterly astonishing. 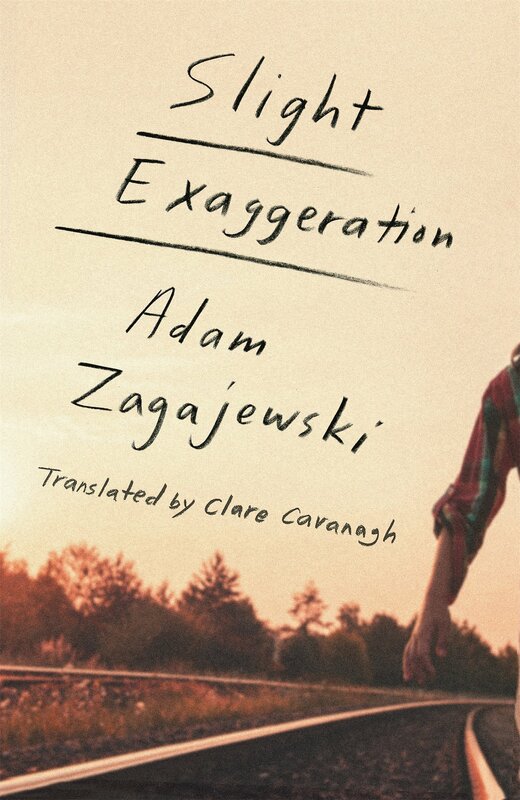 One of the most gifted poets of our time, Adam Zagajewski is a contemporary classic. Few writers in poetry or prose have attained the lucid intelligence and limpid economy of style that are the trademarks of his work. His wry humor, gentle skepticism, and perpetual sense of history’s dark possibilities have earned him a devoted international following. This collection, gracefully translated by Clare Cavanagh, finds the poet returning to the themes that have defined his career-moving meditations on place, language, and history. Unseen Hand is a luminous meeting of art and everyday life. Few writers in either poetry or prose can be said to have attained the lucid intelligence and limpid economy of style that have become a matter of course with Adam Zagajewski. It is these qualities, combined with his wry humor, gentle skepticism, and perpetual sense of history’s dark possibilities, that have earned him a devoted international following. This collection, gracefully translated by Clare Cavanagh, finds the poet reflecting on place, language, and history. Especially moving here are his tributes to writers, friends known in person or in books—people such as Milosz and Sebald, Brodsky and Blake—which intermingle naturally with portraits of family members and loved ones. The Loire rolls its waters slowly. His left would also like to take its leave. And his heart, and his whole body. inside his dark blue windbreaker. made richer by an animal’s unrest.